BREVIER - A double leaf from a breviary. 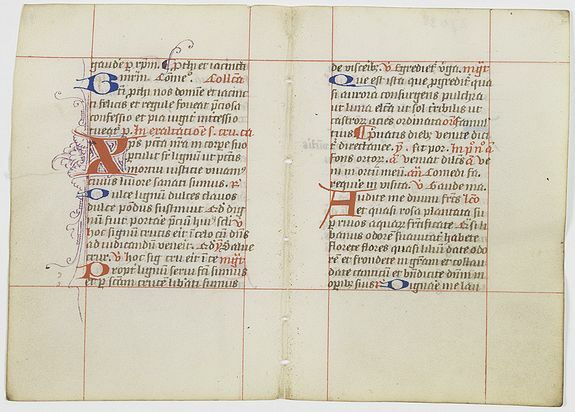 Title : A double leaf from a breviary.. Date : Northern Netherlands ?, ca. 1480. Size : 4.3 x 30.3 inches. / 11.0 x 77.0 cm. Description :Three large 2-line initials in red and or blue for the start of the new capitula. Nice clean leaves, with ample margins, from a breviary, end of the 15th. century. Condition : A double leaf each 18 lines of text in Latin, written in brown ink in an early lettre Batarde. So the double leaf measuring 110x146mm. Probably written in the northern Netherlands.